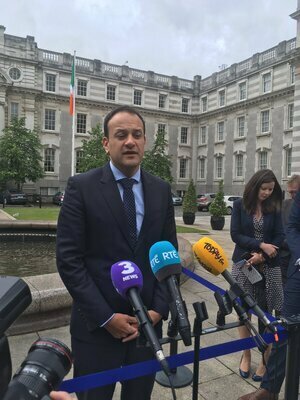 Leo Varadkar, new Minister for Social Protection went on RTÉ’s News at One with Aine Lawlor to discuss the new unemployment figures and his plans to copy the Conservatives get people, including the disabled, off welfare and into work. Leo Varadkar: “Yeah, I’m not sure what they mean by that. I suppose, in my view, you know, any form of work is of value and, if we can take people who are on welfare system, get work and training, there’s always value in that. But the key thing which I think is of crucial importance is that there is progression and you did see in the past, you know, a lot of people going on schemes, particularly the not exclusively Community Employment schemes and going from those back on to welfare. 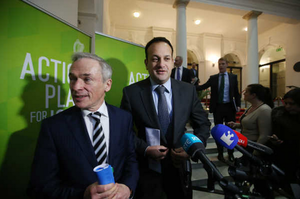 Posted in Misc and tagged Leo Varadkar at 3:07 pm on May 24, 2016 by Broadsheet. Most people would rather work than not. Most people would rather other people worked too. No-one likes subsidising people who chose not to work. Most people don’t mind subsidising people who can’t work. Simples. Leo’s on the ball. But it’s not about that is it. It’s about forcing people who probably can’t work, into work. Probably? If someone can work they should. If they can’t they shouldn’t. Where have you evidence that he is forcing people? The whole point is that people in the UK were forced and leo is following the exact same model. How in the name of God can out assume that this time a politician is going to do things right? You are saying that people who were not able to work in the UK were forced to do so? Who? When? Where? Read the previous articles about it, posted on broadsheet and the links in those articles. There’s plenty of examples for you if you’d like to bother reading them, instead of obtusely commenting without knowing the facts. It’s a running sore in the DWP debate over here, actually. oh for the love of god, Tony. everyone else on this thread knows about it. look it up for god sake. it was also on broadsheet recently i think. paul murphy wrote about it. and yes, people full on died as a result of the draconian policy, and will do here also. My bad. I didn’t go searching for the worst case Tory scenario. Soz. I always seem to have more faith in Ireland than people on here. And we don’t have those policies here yet so I shall continue to do so. No, people in the centre too actually and most decent people with a social conscience. I love the moral implication – if you don’t call it Tory Workfare, you don’t have a social conscience. And all devoid of any data backing this up. I’m so glad this doctor, who was raised by a GP and sent to a private secondary school, gets to make decisions about how much money we should be giving poor people. That privileged wealthy people who were raised in a bubble have no idea what it’s like to be poor and so should probably be kept away from decision making power that affects them. they don’t count because they are on the Left. Well no. These people advocate for the poor. Clearly they know what’s it’s like. Leo is chasing boogeymen. Much like Republicans in the US have been pushing for voter ID laws despite there being little to no evidence of voter fraud happening let alone on a large enough scale to be a problem so poor black people lose their vote over a problem that died just exist. Re: advocate for the poor. No they don’t. They use the poor for their own little revolution. they have no problem in troubled teens going to jail for thei antics, or other people facing fines be advocating non-payment of property charges. Or promising at risk people houses when they can’t deliver. In fairness Dub, you’re either employed by labour or paying a membership fee (not meant as an insult, that’s my genuine opinion) so your opinion on them is pretty biased. I think saying they’ve no problem with kids going to prison for them to be a quite unfair and pretty ridiculous really. Dubloony, “their own little revolution” is advocating for the poor. It just depends on what side you’re coming from. I see nothing wrong with advocating a little civil disobedience if it will force those in power to rethink policies that deepen inequality. Would you advocate that kind of selection process across the ministerial briefs? I’d like rational people who know what they’re talking about given the briefs. Leo, as evidenced by his pursuit of boogeymen which is probably explained by the privileged bubble he grew up in clearly doesn’t know what he’s talking about. If you’re going to change your mind on this sort of thing, at least have the politeness to explain your original error. And don’t try and mix in some casual US race issues. It has nothing to do with this. Have you not met Moyest before? He’s going to try to bludgeon you to death with inanity and get increasingly snippy so he can be seen to have the last morally superior ‘last word’. Not worth the aggro. That Varadkar’s absolutely divorced from the harsh reality some people have to live in daily, but feels he’s qualified to make life-changing decisions for. It’s not that difficult to figure out. That’s because our “betters” always know how the little people should be living their lives. You shouldn’t consider yourself as inferior to anyone. No need to refer to those who are many times more successful that you as your “better” regardless of its accuracy. You won’t improve your situation until you begin to believe in yourself. Pretty sure his point is that privileged wealthy people who were born with advantages most don’t get see themselves as superior to the rest of us. You’re just presuming you know how people see themselves. Unbelievably arrogant, even for you! It’s always entertaining to see the right wingers banding together with their comments. Good job Harry, Kieran and Owen…. People voted for him. To make life-changing decisions on their behalf. He didn’t swoop in out of nowhere. People voted for Danny ‘God controls the weather’ Healy Rae. Should we give him the environment ministry? Or anything? How do we decide who makes life changing decisions then? Perhaps some sort of parliamentary democracy could be used? Parliament decides nothing of the sort. 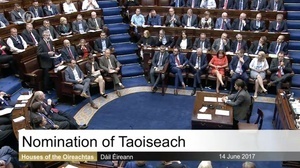 Enda Kenny alone decides who does what – and by tradition the Taoiseach’s main priorities in that decision are geographical, electoral, and personal – before any question of qualification or competence is involved. …first thing he does is abolish JobBridge…at a stroke…that cornerstone of labour acheivement in the previous government. JobBridge was an idea that could have worked well if the correct oversight was used. Instead it got abused to high hell. Using people on the dole to make sandwiches. Awful stuff. Yep. I was on board for Job bridge in the beginning but the more I thought about it the more annoyed I got. Nobody should have to work for free. Internships should be straight up be illegal. The best I saw was a Donegal farmer offering internships in picking potatos. JobBridge hasn’t been abolished. It’ll be refitted. The key stat in Ireland is the participation rate – its about 60%. About 60% of working age people in Ireland actually work. I don’t think its really sustainable to have 40% of working page people not working particularly as our population get older and there’s not enough people to pay for pensions. A lot of what is called “work” is an enterprise designed to make rich people richer regardless of the wider to cost to society, the environment and human dignity. Conscientious objectors should be supported. next he’ll introduce a sub-minimum wage for workers with disabilities, like other right wing pondscum have..
why cant our gov. come up with anything of their own? and of all parties to copy .. the Tories have made Britain like the Britain from V for Vendetta meets The Hunger Games. So… the swiss are about to vote on introducing Basic Income; the Canadians already trialled it thirty years ago and found it was cheaper to run, better for society, led to healthier citizens (and a lower healthcare bill) and had no negative social effects; the UK has even tried similar approaches for tackling homelessness (finding, again, that it’s cheaper and better than the “traditional” approach) — and we’re looking to try Thatcher’s approach again, despite it having failed miserably in the UK the first time round. This is why we don’t have a decent country, but a third world banana republic y’know. What happened to the Canadian trial? 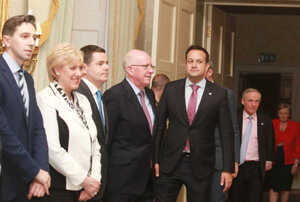 And aren’t FG being accused of trying the existing UK approach? I’ve no problem with seeking to help marginalized people into work, with personal plans, support and assistance. Lone parents aren’t disabled, they are parents. And most parents work. But if it descends into the kind of cruelty that is being handed out in UK, no, not acceptable. Childcare being the biggest obstacle of course. Child care being the massive, totally impregnable barrier Joan Burton ignored when she gleefully pasted the lazy scum, wha? According to Paul Murphy, Seetec who hold the British contract for work capability assessment (WCA), also recently won same in Ireland to provide the services to the government’s JobPath programme. This is obviously in addition to the existing staff that currently exists to access someone’s suitability so how much is it costing to bring this UK Company in? And what was wrong with the existing staff to do the job? It’s great that he’s invented an opinion for THE LEFT to argue against. Well, obviously he won there, since he’s arguing against an opinion he made up and nobody is arguing against. Is that what you learn as debate in posh school? I went to scumbag school and I can see it for the rhetorical crock it is. Please can we stop with this pious Malthusian poo. There is nothing inherently moral about working. Most lower-middle-class jobs are shite. They’re boring, pointless, repetative non-jobs, invented largely to correspond to the ideology of ‘Hard Working Families’ and other sub-Protestant Work Ethic myths which sustain the culture of capitalism and ensure you have to spend eight hours a day duplicating spreadsheets instead of contributing something to humanity. They are not necessary. People only work to make money to live on. Shoving single mothers, people with disabilities, etc., into shite non-jobs duplicating spreadsheets for minimum wage is not giving ‘value’ to their lives. It’s the equivalent of those Victorian workhouse which made people pick ropes apart with their bare hands for no reason other than to keep them in line and preserve against ‘idleness’. We lose far more money, as a society, to tax-evading multinationals than we do to those fabled ‘dossers’. Varadker thinks any work is valuable? He’s an idiot. And you are too, if you buy that BS. I worked in a clinic in London that hosted the ATOS company – they were the people tasked with fudging reports and assessments to oblige long-term unemployed people who were ill or had disabilities into work. And yes they were ruthless b*stards and yes people died or suffered immense misery on their watch. And yes that shite will be imported here, along with every other neoliberal aberration mandated by the IMF, if we don’t start listening to ‘the Left’ and stop bleating about the ‘value’ of work like a bunch of paranoid Puritans en route to the Frontier. Someone spot me, yeah? I’ve no money. What’s Ryan Tubridy doing there?